Acott records department had many, many happy hours were spent there listening to records in the booths, having to make a big, big decision on what to spent your hard-saved 32/6 on. Very, very happy days! In an interview with Gilles Peterson David Rodigan mentions buying reggae from Russell Acott. My first real awareness of The Wailers had been in the mid-sixties when Island released the Put It On It’s Rock Steady album which featured their song ‘Put It On’ and had two cartoon characters on the sleeve with their arms aloft. I thought The Wailers was a great name but only because I imagined someone at sea in a boat – I thought it was The Whalers, as in fishermen. The music wasn’t so much Reggae as Rock Steady, a music form that evolved from Ska with a much cooler, slower beat. 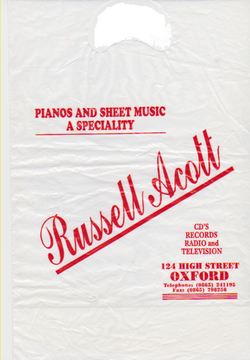 I remember the thrill of hearing the words of the title song – ‘I’m gonna put it on . . .’ – in my local music shop, Russell Acott’s in Oxford High Street. Acott’s was a large traditional shop with a downstairs department where they sold classical music, sheet music, pianos and other musical instruments. On the first floor there was the record department selling everything from The Bachelors to Jim Reeves. Luckily for me, the assistants behind the counter, Margaret and Janet, were passionate about Jamaican Ska and Rock Steady. Island Records and other labels were releasing seven-inch singles and the two women bought them from the travelling record salesmen who would bring them to Oxford because of its small West Indian community. You could choose the songs you wanted to hear, and they would pile up your chosen records and you would be told to go into your private listening booth and stand there while they would play your selections. You then decided whether you wanted to purchase or not. David Rodigan My Life In Reggae 2017.